Just what I need! I have to replace my windshield wipes! 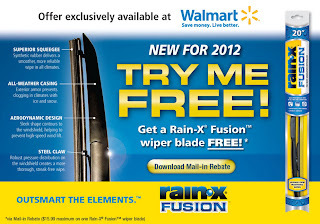 1) Purchase a Rain-X® Fusion™ wiper blade. 2) Send the completed rebate form along with your original dated Walmart cash register receipt showing the required purchase between March 1, 2012 - March 31, 2012. Receipt must have product purchase price circled.